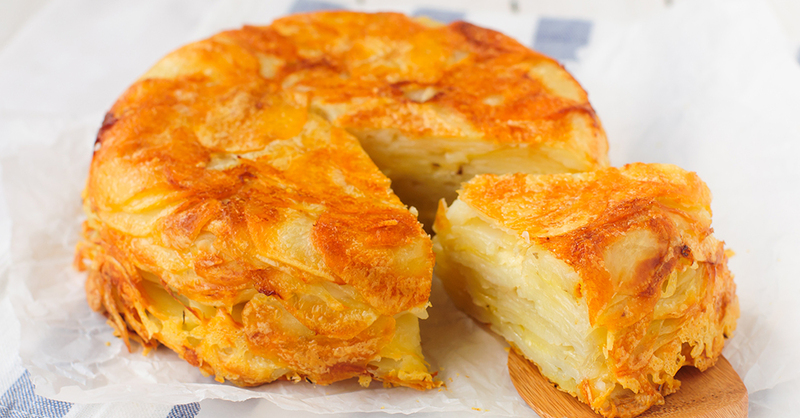 If you like trying new recipes, this pretty potato upside down cake is quickly going to become one of your favorites. The ingredient list is simple, but it’s just a testament to the fact that you don’t need much to make potatoes shine. The layers of thinly sliced spuds develop a crispy brown crust on the outside – which makes for lovely presentation – while the center is still perfectly tender. We’ve served this both as a side dish and as a main dish, depending on the time of day and what our family feels like eating, but you really can’t go wrong either way. If you’ve been wondering what to do with those lone potatoes in the back of your pantry, look no further, this recipe is always a winner! Add oil to the skillet and heat until it's shimmering and ripply. Remove pan from heat and add potatoes in a spiral formation; the potatoes on the bottom of the skillet will be the top of the "cake." Once all the slices are in the pan, press it flat like a cake.